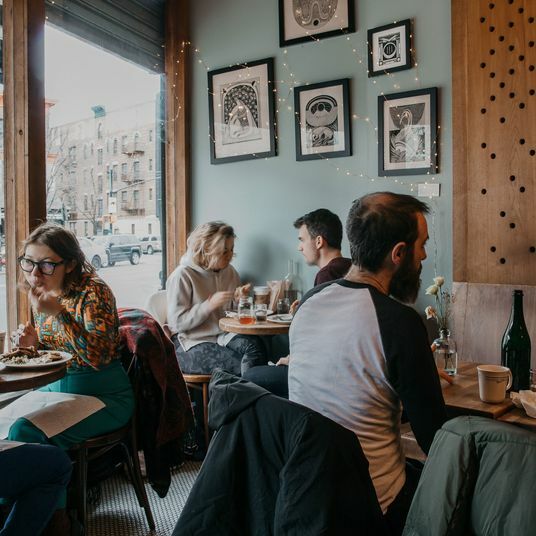 Even as the neighborhood has filled with glassy fortresses and brutalist condos, Williamsburg has somehow managed to maintain its reputation as a place where restaurateurs go to try something that might not work in Manhattan. 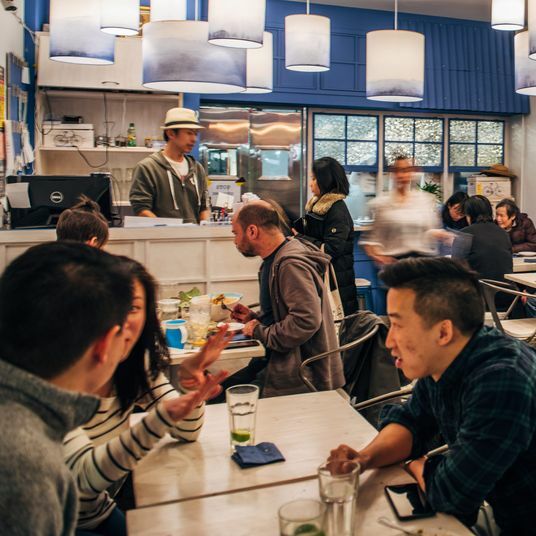 The restaurant scene is so saturated, in fact, that there are dozens of adventurous pizza places, sushi spots, and Southern restaurants that would easily place on a longer list. Establishments with distinct culinary missions were selected for this round, along with how well and how consistently they are executed. 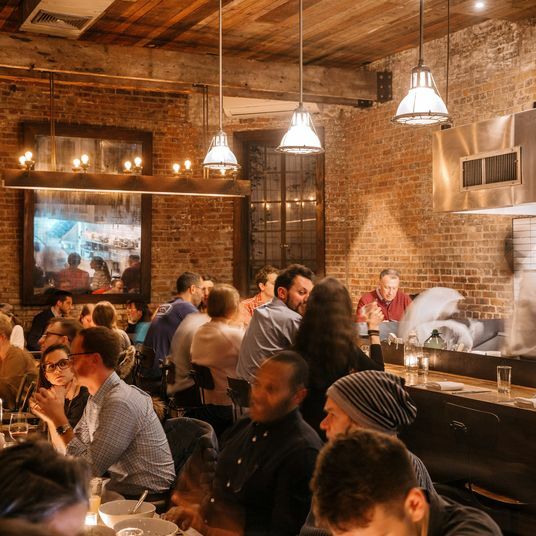 Here are the absolute best restaurants in Williamsburg. Missy Robbins’s pink peppercorn and Parmigiano-Reggiano mafaldini should do for post-millennial pasta what spaghetti primavera did for Le Cirque decades ago. 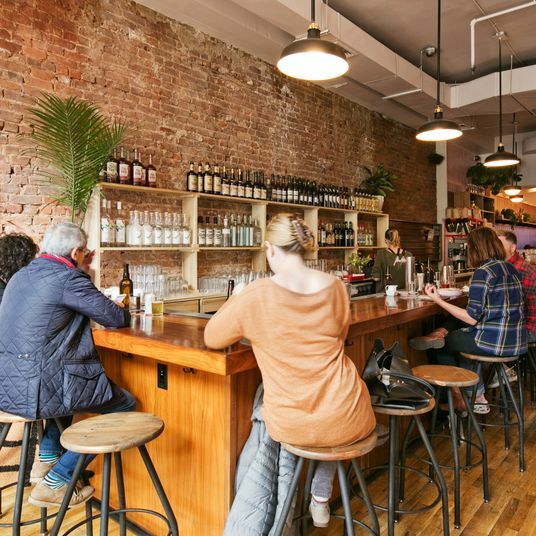 Try the rigatoni, ravioli, and cappelletti, though, too, because the excellent pasta course is the most likely reason the bustling, hangarlike restaurant is the toughest neighborhood reservation to land. Robbins’s light touch with sardines (with capers and dill on grilled garlic bread) and blowfish tails (with astringent, herbaceous salmoriglio) could warrant a spinoff devoted to undersung seafood. Dishes like mozzarella sprinkled with bottarga and pomodoro-braised cannellini beans are prime examples of how simple ingredients can be luxurious, just as the lamb-leg steak topped with dressed raw fennel and celery is an offcut elevated to spectacular heights. 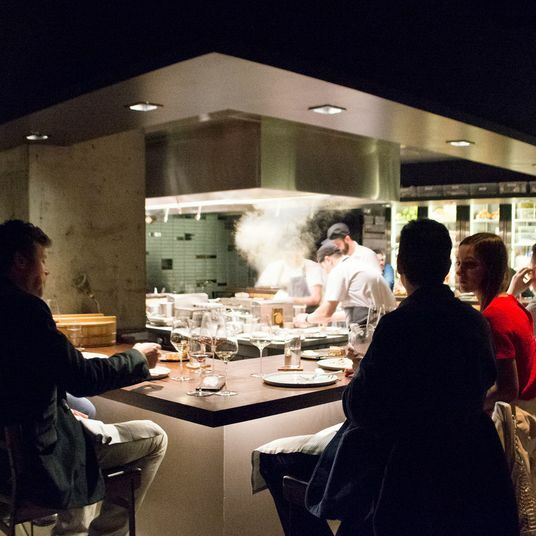 In accordance with the unwritten rules of Nordic futurist fine dining, the room is dark and semi-spotlit. There are conspicuously few tables, to the point that it wouldn’t be weird at all if the lawyer at the next table who just flew in from Hong Kong stood up suddenly and launched into an Ionesco monologue. 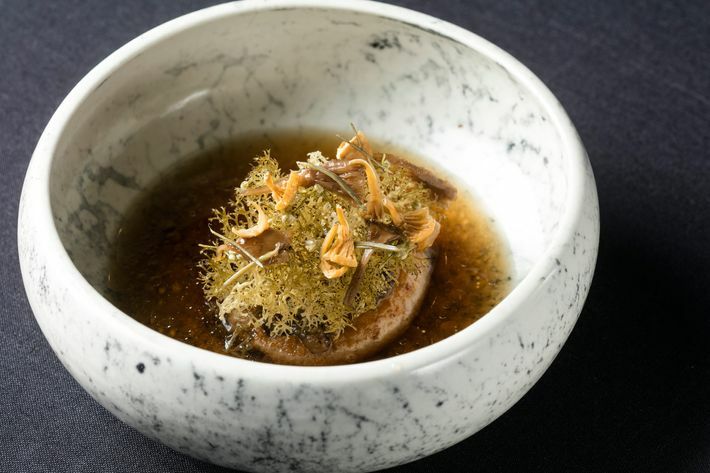 Dinner unfurls at a processional pace: A tuft of dehydrated and fried lichen atop reduced, almost-candied cream, in chanterelle broth and a float of spruce vinegar; a hefty spoonful of Finnish caviar dissolving in lemon-verbena broth, pearl-onion petals on the side; gently cooked Glidden Point oysters, arranged like pearly doubloons and dotted with oil made from pressed juniper shoots. 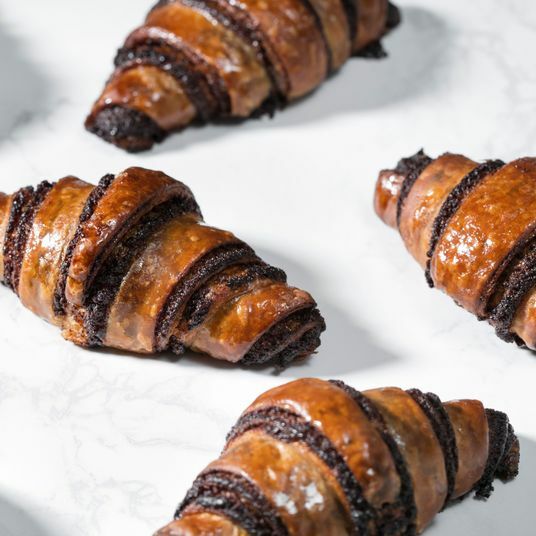 Flavors can seem remote, and that’s often the point, because it renders the contrast of each emulsified, smoked, fermented, pressed, steeped, crisped, or pickled ingredient into all the more standout and elegant bites. Depending on how you feel about the idea of ecological marginalia so crucial to this style of edgy fine dining, your impression of the special effects may vary. No one can argue, however, with a pool of strawberry juice collected last summer and fermented, set down with a perfect quenelle of milk sorbet in the dead of February. 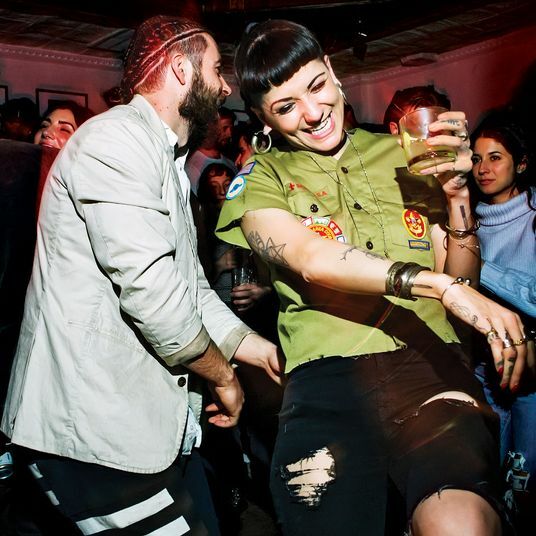 Since taking charge of the kitchen in late 2017, Christina Lecki has been blasting whole heads of cauliflower in the embers, whipping wood-fired squash into zabaglione-like clouds, and tweaking the stately Wythe Hotel dining room with a root-cellar Gothic sort of vibe. The super-French wine list seems better than ever suited to the food, which isn’t all veggies: Coppa di testa with hot chilies and charred onions is presented with butterhead lettuce for DIY head-cheese wraps. Housemade merguez pairs nicely with warm sourdough flatbread, and provides the exact sort of gutsy, plucky element the handsome space needed. 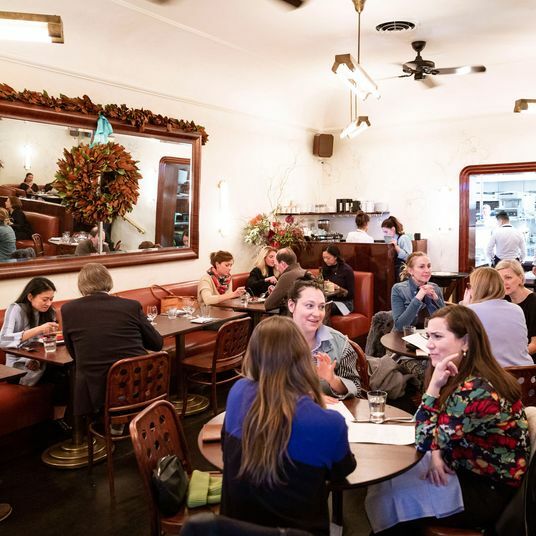 The trio of stacked, saucerlike malted pancakes — doused with liquefied maple-hazelnut praline, crowned with a pat of brown butter — are the de facto showstoppers, the house’s certified Instagram star. For anyone who’s ever been burned by abysmal brunch, which is everyone, the good news is that these are very good pancakes. The better news is chef Jaime Young’s dinner menu. There are gougères with grated black truffle and a drift of white cheddar, and a rib eye with koji brown butter and black garlic jam. It’s all stuff cooks might cook for other cooks. Even the leaves in salads come from prestige lettuces, what’s served at status restaurants, but no one brags about the farmer or smirks through tableside patter. It’s just assumed that because the back of the house finds it delicious, you will, too. With its base of citruslike ají amarillo peppers, Peruvian salsa ocopa is a workhorse sauce, usually paired with humdrum boiled potatoes. Here, the condiment gains more interesting work in a composed plate of peanuts and crisp anchovies, plus ribbons of roasted hunks of brightly colored winter root vegetables. 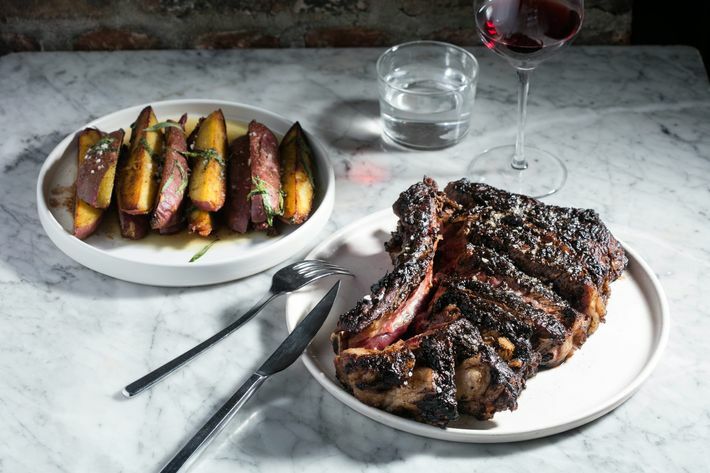 Chef Eric Ramirez actually offers a limited-edition tasting menu on Tuesdays, but like his flame-grilled beef heart and smoky roast chicken with Huancaína, most dishes are set up like fine dining, but they all land like exceptional comfort food. 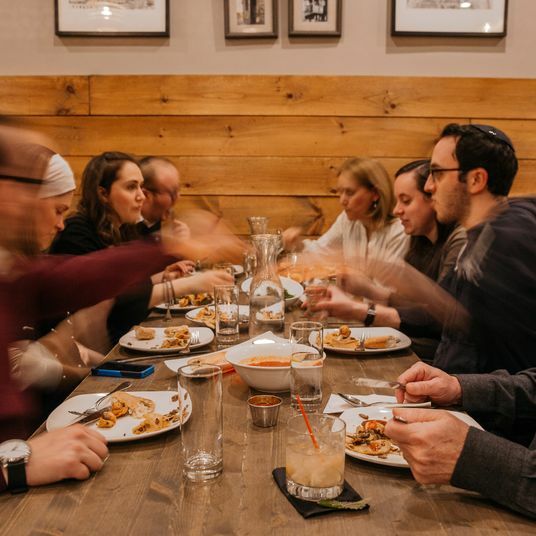 Between the Underground Gourmet–praised butcher’s steak and the Platt-endorsed sirloin, the bustling hipster chophouse tends to get more done with fewer square feet and cubic ounces of meat than Peter Luger nearby. Beef aside, whole mackerel is great, and no one seems to order the lamb shoulder chop doused with salsa verde, but anyone who appreciates a little fat definitely should. The fermentation extravaganza known as stinky tofu is one of those tough-to-find Taiwanese specialties that once would have whipped Chowhounders into a cross-borough tizzy. Luckily for everyone, it’s now freely available here, in a somewhat cheffed-up form, along with excellent oyster omelettes studded with briny Beausoleils and heritage pork. Don’t miss zhajiangmian, or thick egg noodles bound with lamb and fermented soybean paste, and the Big Chicken, a.k.a. the most delightfully unruly dark-meat sandwich in town right now. At this bustling Sichuan restaurant, your server for the evening will be an almost-famous Instagram poet, or someone who’ll be plucked from indie-film obscurity to helm a Marvel Phase VI tentpole in 2029 starring an actor who’s currently in preschool. All that’s to say that if the dining room is sometimes spotty and unfocused, the cumin lamb is not. 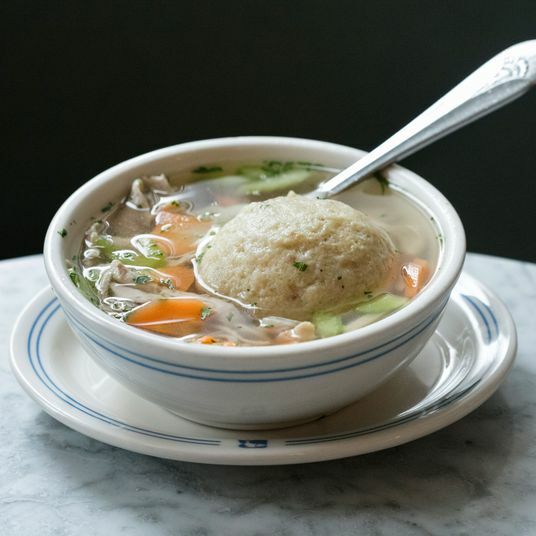 Neither are the chili-oil dumplings, or the whole-braised tilapia half-sunk in a deep dish of spicy miso and fragrant coriander, or the wobbly, housemade tofu with cracked Sichuan peppercorns. 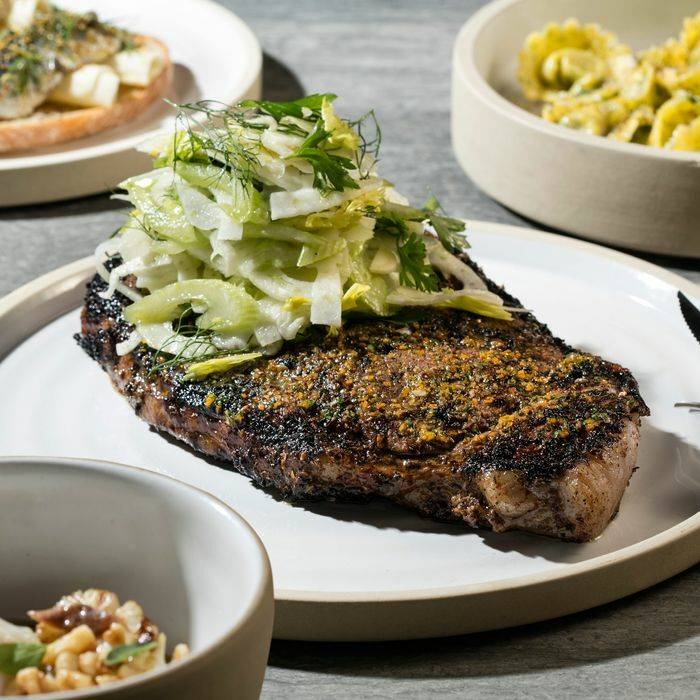 It may be near the waterfront as opposed to on it, but in terms of New American signifiers like St. Louis ribs and spiced duck breast, Meadowsweet at times comes across as a more relaxed, less staid River Café. 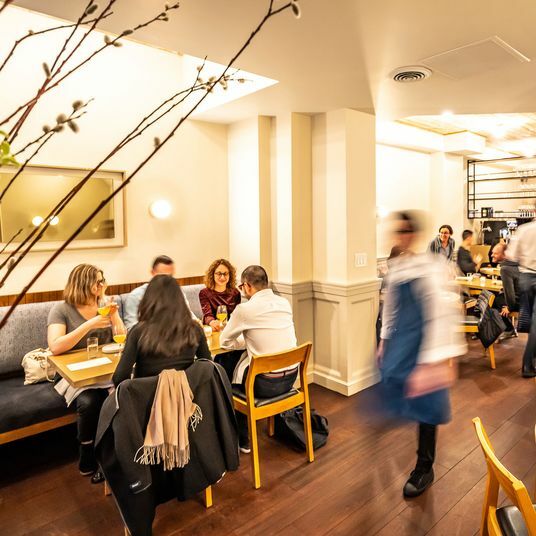 Brunch-time duck hash, cinnamon sugared doughnut holes, and a facsimile of ‘ino’s lamented truffled egg toast are enough of a draw, while the $85 five-course tasting is a steal. Small dishes like brûléed uni arranged atop fettuccine or tiny dehydrated shrimp buttered up with bottarga on flatbread match well with the big wine list, which skews interesting producers and includes a lot of unexpected bottles. Boquerones, clam strips, and squid combine forces in the super-artsy fritto misto; the fry-up, like most everything else on the menu, adheres to an understated theme of sustainable seafood. The quirkily highbrow caviar happy hour nicely includes dollar littlenecks and two-dollar Lady Slipper oysters for people who don’t own glassy East River condos, while the provenance of the funnel cake and saltwater taffy mignardises is straight-up Asbury Park. 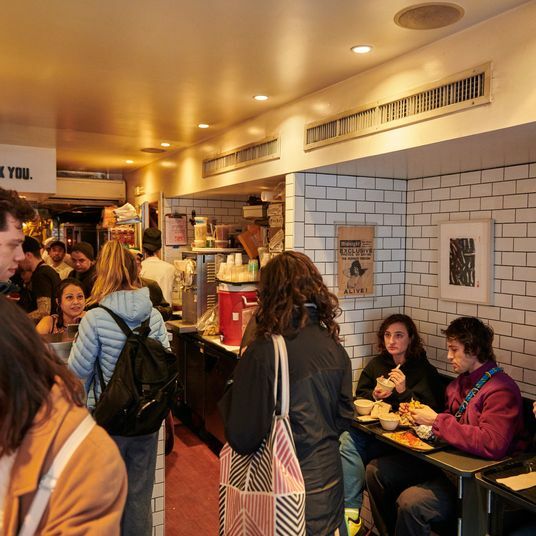 A hamburger and friendly check-in is always in order at Diner, the vault-ceilinged and cramped dining car that’s, since 1999, informed menus and aesthetics of countless local and farther-flung restaurants. 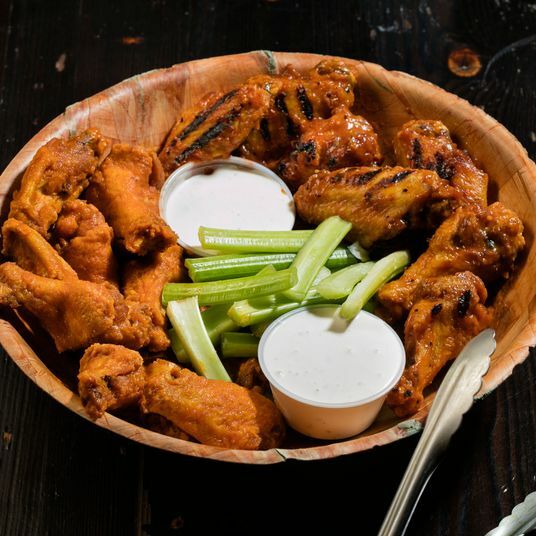 The thing is, its next-door sibling has more wiggle room and a generally heartier menu. Golden, crisp-skinned brick chicken is the permanent menu item; the rest, such as deeply flavored white beans and salads of bitter chicories in winter, is all about seasonality. The mind-boggling list of wines from practicing organic and biodynamic producers is neatly organized into divisions like “New Additions” and “Last Call,” and a server may be inclined to organize an impromptu one-glass swap of the white Burgundy on your table with a different variety from the same winemaker being sipped by a two-top at the bar. It’s a nifty trick. “Cured” small plates such as raw Montauk scallops with pearly morsels of finger lime and white soy, or rosy chopped beef tartare with buttermilk and sesame, are ideal for by-the-glass drinking, but it’s also easy to make an excellent meal out of charcuterie and cheese like robiola, presented with dainty, cheffy condiments such as tomato preserves. The centerpiece of New York’s absolute best — prettiest, too, while we’re at it — breakfast is a clean-cut slab of local fish cured simply with konbu, or dunked in sake lees, or miso-slathered, or salted. 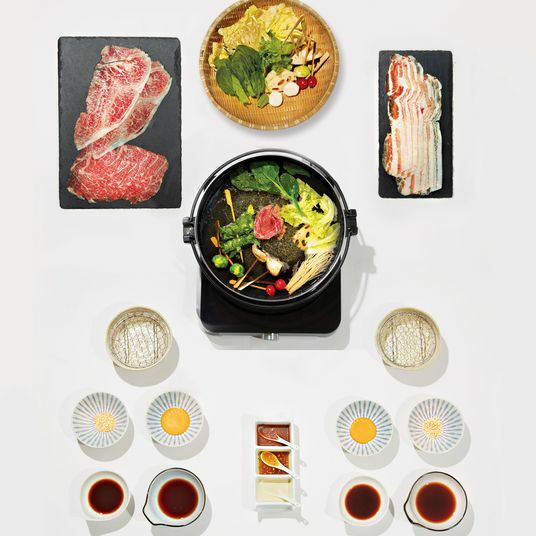 A plump cube of custardy egg offsets the fish, with pickles, seven-grain rice, tea, and a bowl of miso soup on the side, and the overall effect prompts most diners to wonder why every day does not begin like this. At night, the space morphs into a showcase for Yuji Haraguchi’s inventive mazemen and fat-dappled bowls of ramen. The selling point of squarish Detroit-style pies is a crust that has a nice salty mantle, as if a pan of focaccia landed squarely in the path of lava made of molten fried cheese. As far as toppings go, what at first seems cavalier — Emmy’s namesake pie has mozzarella, onions, tart banana peppers, and ranch dressing, with red sauce served only on the side — invariably yields a sort of gonzo genius, which carries over to the pretzel-bunned chicken-parm sandwich and messy, double-stack burger. 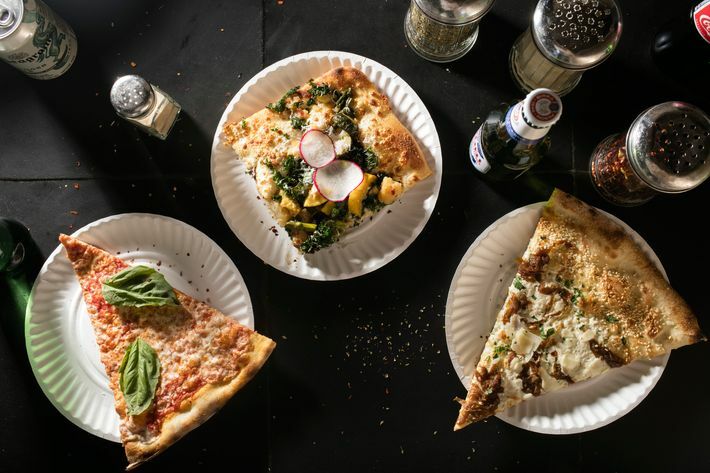 If New York City Pie was a 100-level college class, Best Pizza would be a crucial part of the syllabus, starting with the 20-inch plain cheese. Established ca. 2010, Best Pizza is not particularly ancient; but it’s wood-burning oven, a literal hole-in-the-wall, is, and there’s not one molecule of irony in the pizza parlor’s glorious chili-flake shakers, pleated paper plates, or house red. 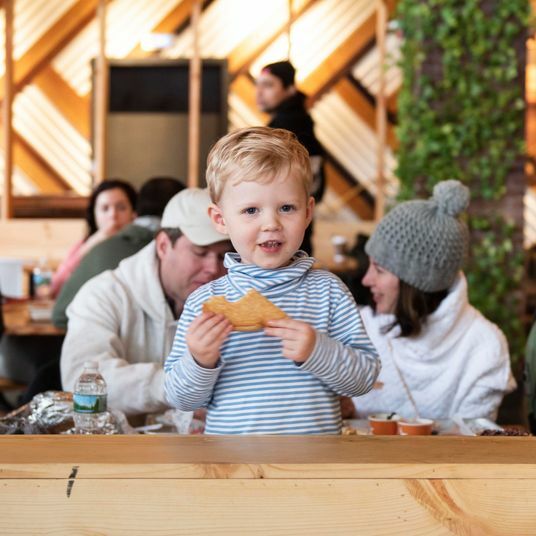 Vinegar-doused romaine salad is textbook lower-Brooklyn slice joint; and fresh from the oven, the cheesy, oily garlic knots have the chew of delectable, squishy dumplings. No one else makes them like that anymore. Chef and owner Albert Di Meglio’s knack for fine-tuned flavor and contrast abounds in silky mozzarella, the crunch of his green-market giardiniera, and the simultaneous deployment of both textures in the sheep’s-milk cannoli. That aside, Barano’s best quality may just be its seemingly inbuilt sense of welcoming. 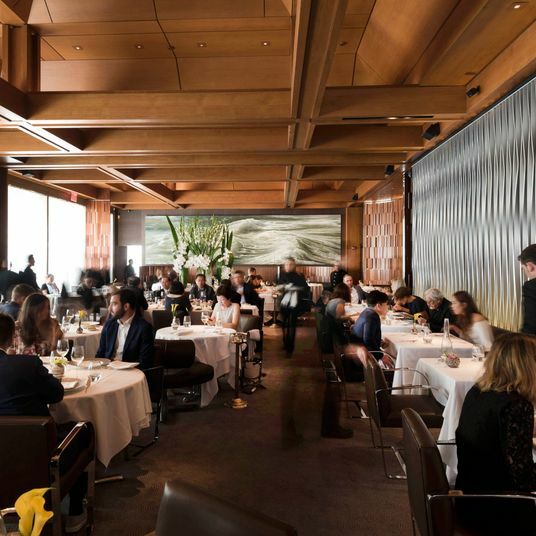 The sleek dining room has got legroom to spare, gluten-free options are proffered without a fuss, and each of the three increasingly elaborate tiers of large-party, family-style feast — all featuring a star-making turn of smoky eggplant served parm style — is a great value. Mathieu Palombino’s Motorino is a bona fide chainlet, going strong in the Philippines and beyond, but the good news is that its Brooklyn flagship still functions like a solid neighborhood spot. Clam pizzas are wonderfully puffy and charred. Sides like roast artichoke rivals osteria; the tiramisu retains its from-scratch fluffiness. And, crucially, the place is open late. Tortillas made with heirloom corn are fantastic vehicles for tostadas layered with raw scallops with salsa macha, or generous bits of uni and a deft chiffonade of bitter herbs. The kitchen nails the flavor of cochinita, and chicken with a sheeny mole made from nuts and seeds arrives as an intact leg, but pulls apart with a mere swipe of a fork. 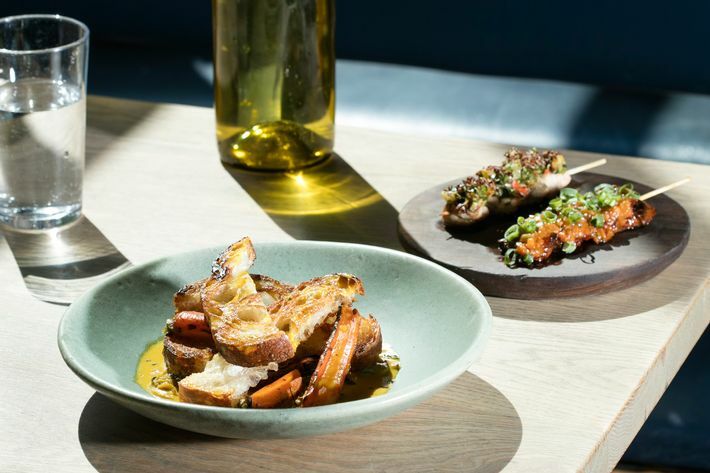 Casa Pública is ambitious without being ostentatious — even the salsas seem to have distinct personalities — and if that doesn’t impress, maybe the churros with cajeta will. After 118 years, there’s no sign that the saucy zuppa di clams, hulking pizzaiola pork chops, or tender artichokes wilted under an avalanche of cheesy garlic bread crumbs are going anywhere soon. 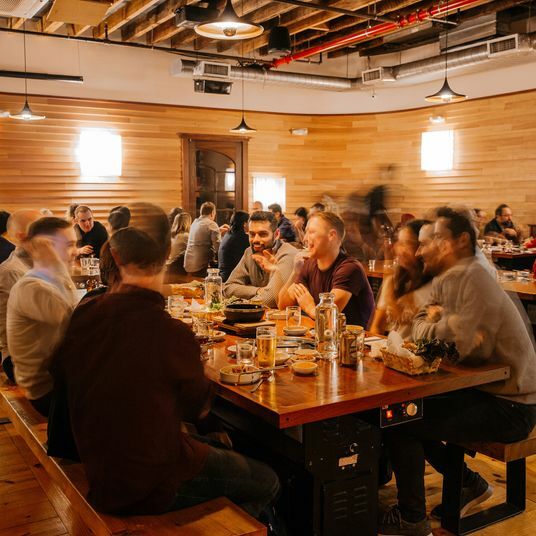 An entire menu based on “mid-Atlantic” cuisine turns out to be resolutely unflashy, and that’s the point. Patti Jackson’s ode to somewhat bygone regional eats one might find in former factory, fishing, and farm towns provides a nice opening for hearty spaetzle, dandelion greens, Blue Points Rockefeller, potpie, and Pennsylvania Dutch deep cuts like schnitz und gnepp, a vivacious ham-and-dumpling medley. What else? 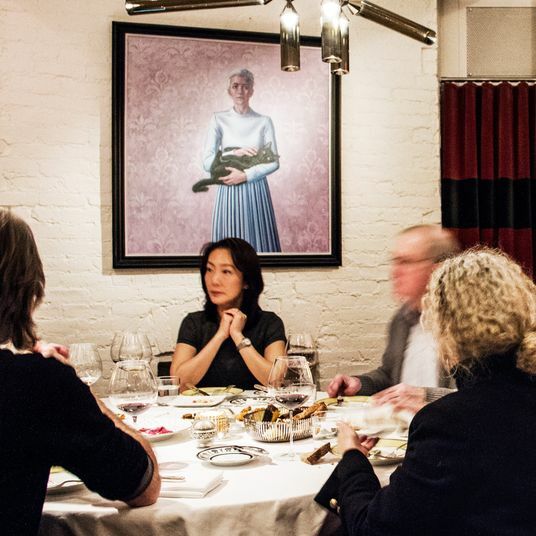 Jackson is one of New York’s most underrated chefs, and her prix fixe menu is a great value. 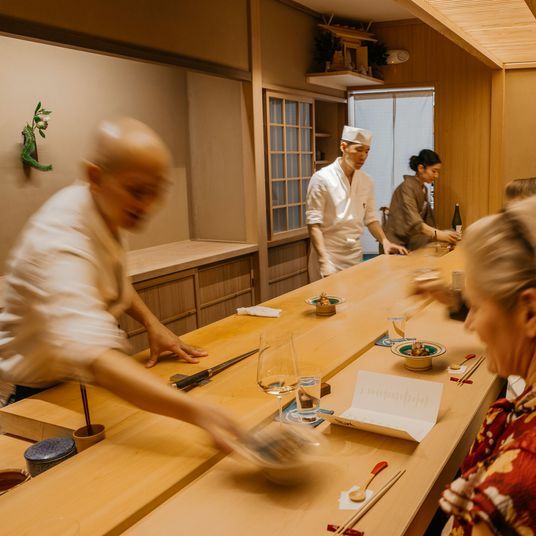 Okonomi’s sister establishment Osakana is not so much a restaurant as it is a top-notch fish market wrapped around the beating, ponzu-flushed heart of a counter-service izakaya. Seafood is minimally handled and the menu changes daily, but there’s usually ramen in broth made from roasted fish bones. Other highlights include donburi brimming with spicy tuna, or sticky, briny spoonfuls of natto and Maine uni. 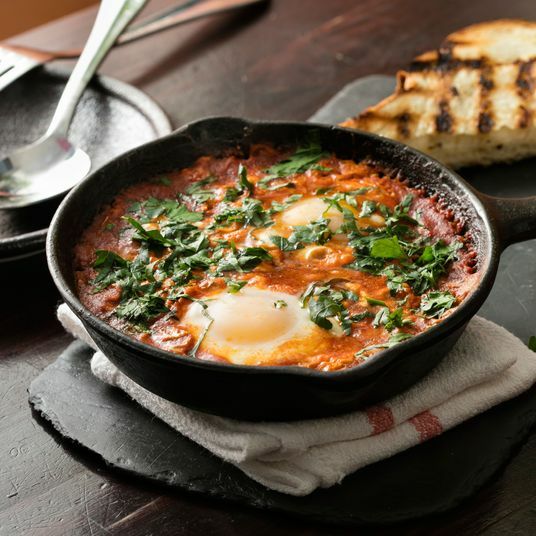 Despite attempts to branch out with breakfast-adjacent items like chicken-cutlet and pulled-pork sandwiches, the all-day, every-day lure of Egg’s famed Col. Bill Newsom’s superb Kentucky-ham biscuits and now canonized Eggs Rothko have proven irresistible, if not indispensable, to the neighborhood. Regardless, the cornmeal-fried oyster sandwich is a breezy delight, served with a tangle of distinctly local greens, and happy-hour pimento cheese fries should definitely have more fans. Hot chicken comes with wacky nasturtium ranch, and the burger is topped with tangy cabbage and Russian dressing, so it could almost pass for a Reuben. That said, Rider is less like a fusion den and more like an already smart bistro on nootropics. Brassicas figure into Thai food, for example, just as pork simmered with red chilies is very Italian, so it goes that broccoli rabe with laab splits the difference between a Bangkok street stall and an Italian butcher’s showroom, and to great effect.